We hired pour me bartending for our wedding on August 4th. I can not say enough about how great they were. I was so impressed with everything about the service. The owner Kathy was there helping me step by step with anything I had questions on. She was quick on every reply when I had a question for her and never made me wait. The bartenders that showed up for my wedding were so friendly and had everything under control from the time they arrived. Our wedding planner and other vendors said how easy they were to work with. They even helped the caterer clean up after the party was done. I would highly recommend hiring this service for any wedding. As a wedding coordinator, it's very important to me that the vendors I work with are professional, attentive, and great at what they do! Pour Me Bartending was all this and more. I thoroughly enjoy working with Pour Me and would recommend them to any couple looking for a friendly group of bartenders and mixologists! We held a bash to celebrate our 25th wedding anniversary. The 3 folks from Pour Me were wonderful! So professional, very efficient, friendly to all our guests, a seamless experience. We used pour me bartending for our Halloween party with around 90 guests. The Service was awesome, the bartenders were personable, And the price was extremely reasonable. I would definitely use poor me bartending for our next party. Hats off for a great job. Thank you so much. The team at Pour Me Bartending were amazing for our event. They were great to work with from planning through serving. It made it a great night! This service was very flexible and able to help us out with bartending on very short notice. The owner Kathy, was very responsive and helpful when shopping for our DIY bar. She made us very comfortable with the process. The bartenders were professional, friendly and efficient! Our guests really enjoyed the night! Thank you Pour Me Bartending! From the very start the owner, Kathy, was incredibly helpful and patient with all of my questions (and I had a TON of questions)!! She worked within our budget and provided a lot of guidance on the amount of supplies/beverages that we would need for our wedding. The two bartenders we had (I wish I could remember their names!) were so awesome! Our guests loved them and they built relationships with our guests throughout the day, which I truly feel enhanced everyone's experience. They even went around and helped us to clean up plates, etc. which was not expected of them and was so appreciated! I would highly recommend Pour Me Bartending! Pour Me was amazing to work with from start to finish! Kathy was really helpful while planning, and our bartenders were excellent - fun, professional, friendly, and efficient. The drinks were great, and the service was outstanding! Pour Me Bartending , LLC is the bartending service we choose to use year after year for our wedding venue at Lake Shore Village Resort. 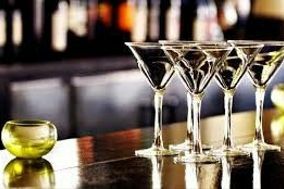 Our couples have been so happy with the personal attention they receive from the owner Kathy, high quality and professional bartending service, personable and knowledgeable staff... I could go on. As a wedding coordinator, it is so important to have good rapport with your vendors and Pour Me Bartending is definitely outstanding when it comes to communication and reliability. Top notch! We used Pour Me Bartending for our wedding 8/25 at Lake Shore Village Resort. Kathy was wonderful to work with and responded very quickly. We were nervous about running out of alcohol but we weren't even close! They gave us a very detailed shopping list to buy from, which made the whole thing stress free! We loved being able to purchase our own alcohol, and shop the deals :) Thank you Pour Me Bartending!! Overall amazing experience with Pour Me Bartending for our wedding! They were very communicative from start to finish and were able to accomodate all of our needs. The Bartenders on site were extremely professional and knew what they were doing. They were very well prepared and didn't need a ton of direction. We had a Margarita Signature cocktail and they brought materials to pre-mix the entire batch so people would not be waiting in line for drinks. I would highly recommend Pour Me Bartending and if I ever need them for any other type of event again I will definitely be contacting! Pour me bartending was the best decision I made for my big day!! The bartenders arrived over 2 hours before the event to set up and everything looked amazing. Kathy supplied containers to serve specialty cocktails at a rapid pace so none of my guests had to wait on a hot day, she also supplied a water station with infused waters that all of my guests loved!! They went out of their way whenever there was a slow period to help out the catering staff and clear the trash and plates from the table and checking on my elderly family to see if they could bring anything to them! I didn't have to think twice to slip them a little something extra at the end of the night- they were well worth it!!!! THANK YOU- YOU WILL BE GETTING ALL OF MY REFERRALS!!!!! Pour me bartending was the vendor at our wedding. I cannot even begin to describe how amazing and professional they were. They stayed 3.5 extra hours and were so happy and incredibly kind. They remembered my drink order, there was never a line, the communication was amazing before during and after the event. They came more than 2 hours early to chill all of the alcohol (which they helped immensely with recommendations as to what to buy). They also recommended great websites with inexpensive options for glasses and mixers! Kathy is seriously a rock star and deserves the world. Thank you, thank you thank you. You guys are amazing. Just a quick note to say how great our experience was having Pour Me as the bartending service for our wedding on 6/2/18! All three members of the bar staff were excellent. They were very personable, professional and quick! There were no lines, and the drinks were on point! And that is saying something for a giant tent full of 140 adults who needed beverages. Would definitely be my first choice for future bar needs! interactive with the guests in a fun yet professional manner! I would highly recommend them!! Pour Me Bartending was so amazing. They served our rehearsal dinner and wedding in Tamaworth. They were professional, curteous and so friendly. 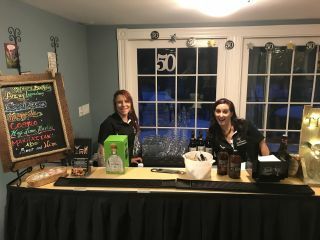 Our little over 200 guests loved our two bartenders, Erin and Jocelyn. Kathy was available whenever I had a question and has some of the most amazing signature cocktail ideas!!! 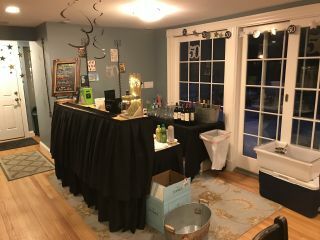 We hired Pour Me bartending for a birthday event at my home on 3/17/18. Kathy was fantastic about helpting me get organised and picking some great drink selections. Holly and Kristen showed up a couple of hours before start time and set up the bar. They did a fanastic job keeping the drinks rolling and the party was a huge success. higly recommend these guys! Great experience. two years in a row we have used them for a special event in our store. Worth every penny! Customers love that we do a wine and cheese party. Terrific night had by all! We had a wonderful experience working with Pour Me. From quote to supporting us on how much alcohol to purchase to the absolutely wonderful bartenders, we were thrilled with the service. We would definitely recommend Pour Me to other couples. I hired Kathy from Pour Me Bartending, they were amazing, our wedding was over 200 guest and the bartenders never had a line, they were great, friendly and by far one of the best companies I have ever seen, since we go to a lot of weddings. I would recommend Pour Me to anyone looking for a detailed, and well knowledgeable company! We never had to worry about anything when it came to the bar, when I sent a message, Kathy the owner always replied to me unbelievably fast. She was friendly and knew how to address anything I had questions on. She made this process so easy to deal with and she was so relaxed and assured me that the day would go off without any issues, I am so glad I hired Pour Me and if anyone is looking for a Bartending company, look no further, you have found the best right here! We hired Pour Me Bartending to do our wedding in June of 2017 the bartender's that we had were amazing they knew how to make every drink and we didn't have to worry about anything for the entire night on the bar. Kathy, the owner of the company, was always there whenever we had questions from the day we contacted her until the day of the wedding. I would definitely recommend this company to do any type of event big or small they were amazing and knew everything that needed to be done without my wedding planner looking over them. Great service, great bartenders! We used Pour Me Bartending for our wedding on September 9, 2017, we had 2 bartenders that were simply amazing, they kept the line to a very minimal and after the 1st rush of the night there was never any lines due to they remembered what everyone was drinking, now that is impressive with a reception with over 180 guest. I worked closely with Kathy to go over what exactly we needed for our wedding. From how much Ice I needed to order to how much glassware was needed, thankfully she knows her stuff and was so willing to help us out with anything we had questions on. I would recommend Pour Me for any type of event, due to if they pulled off our wedding with so many of our guest saying they loved them, then they can pull off anything! We were so impressed with pour me bartending ! We used them through our LSVR venue and we are so thankful! They were so fast and remembered what everyone was drinking! Amazing! I just recently had Pour Me Bartending bartend my wedding in June. I was actually talking to my rental company for suggestions and she had worked with them several times and said "go with them, they're the best ones and the only ones that I would highly recommend". I am so glad we did! Kathy was so accommodating and helpful because I literally had no idea what I was doing in purchasing liquor for an event like this. She was quick with suggestions of signature cocktails we could do and also was happy to serve one that we had found that we liked. We had two bartenders and one bar back and there was never a line for drinks (with more then 180 people there!) They were so happy and friendly and truly seemed like they enjoyed their job! I was off getting ready for the day, yet once the reception started, they had everything set up and ready to go without any direction from me! They were simply THE BEST!! Kathy also touched base after to make sure everything went okay which was so nice and considerate! I have nothing but good things to say about Pour Me Bartending and so lucky we had them for our day!